Turns out Canadian cosplayers have some pretty great chops. This totally makes sense — half the science fiction TV shows, and a lot of the movies, are made in Canada these days. 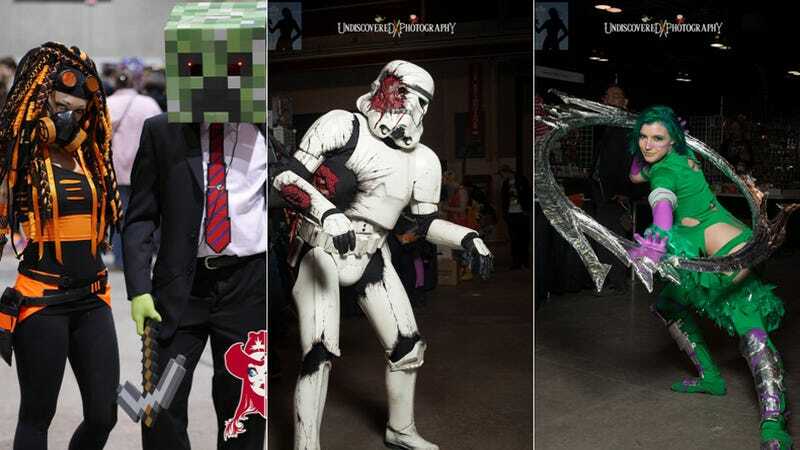 So it's no surprise that the Calgary Comic and Entertainment Expo has featured some jaw-dropping cosplay so far. Last weekend, we brought you a ton of cosplay from WonderCon in Anaheim, and now this week we're stoked to feature some lovely cosplay from Calgary. The ace photographers at Undiscovered Photography were kind enough to let us use some of their photos from the event — see more of their photos at their Facebook page and at Seattle Geeky Girls. Also, the Official Calgary Expo Flickr Page graciously allowed us to use some of their photos, with attribution. And the Undiscovered Photography folks wanted us to mention that the fem Rengar is Kitnip Cosplay and the fem Udyr is Naytay Cosplay. They're hoping to get more links to official Facebook pages of cosplayers, so we can highlight them wherever possible. Copyright Calgary Expo 2014, via the Official Flickr Page. Kratos by Henchman Props and Cosplay. Copyright Calgary Expo 2014, via the Official Flickr Page.